March is International Women’s Month! 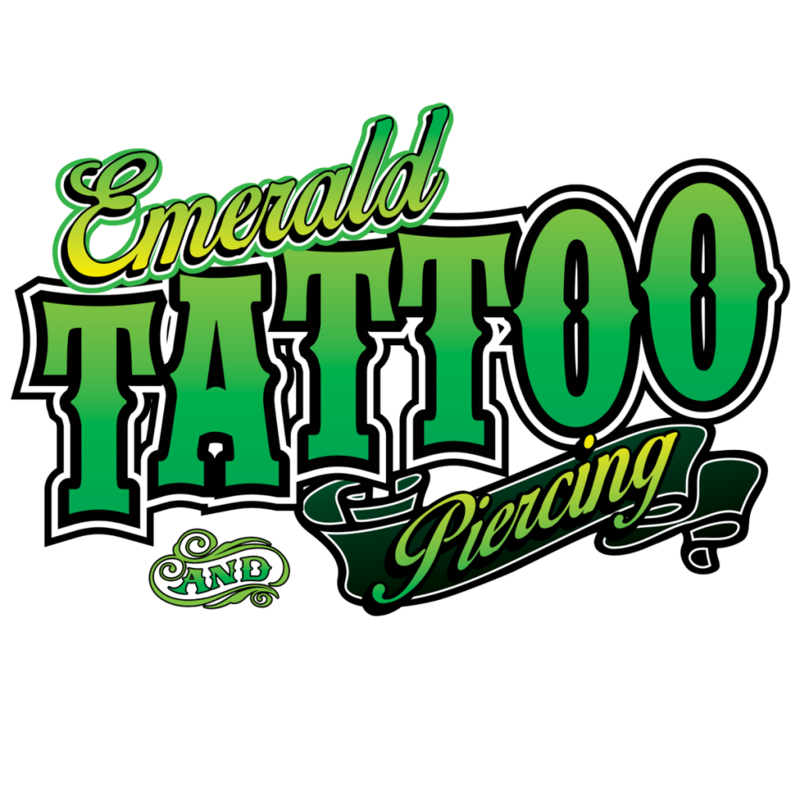 So we’re taking time to spotlight all the women of Emerald Tattoo & Piercing, our female tattoo artists, piercers, and managers. We want to get inside their heads and find out what it’s like to be a woman in a male dominated industry. 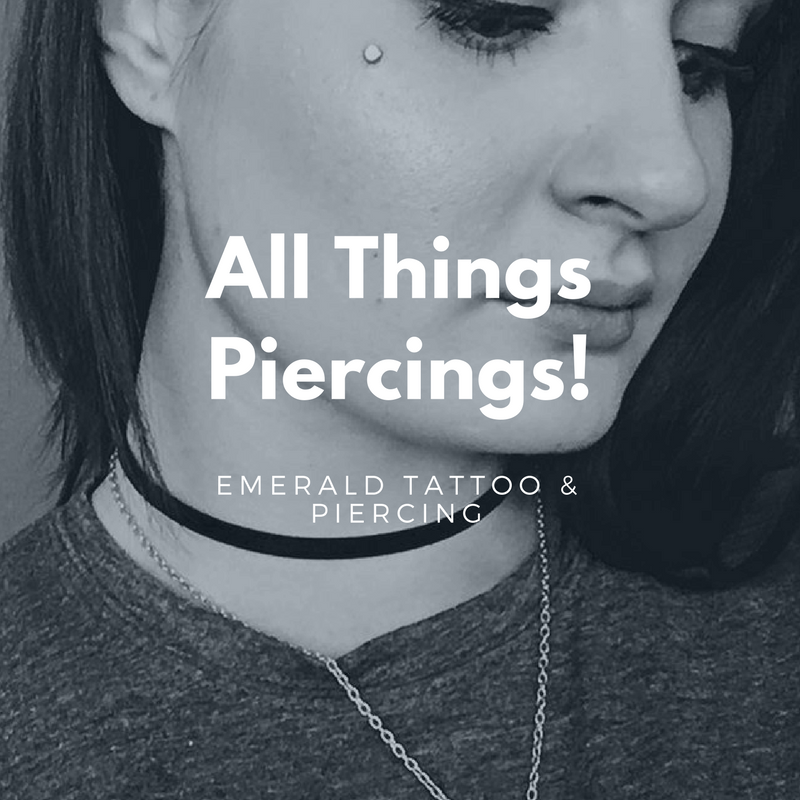 Our first interviewee is one our newest members of the Emerald family, Jen! She’s a tattoo artist, a fiance, and a dog mom. If you haven’t had the pleasure of meeting her, you should take some time and stop by our Lodi shop to say hi! Check out her portfolio here! 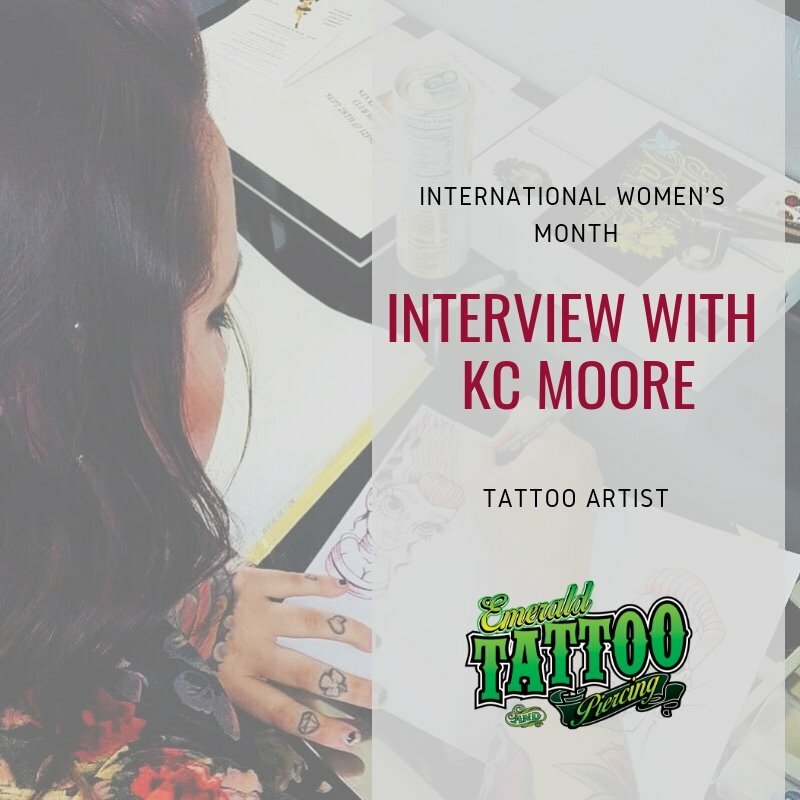 Keep reading to find out more about her, and her experience as a female tattoo artist. 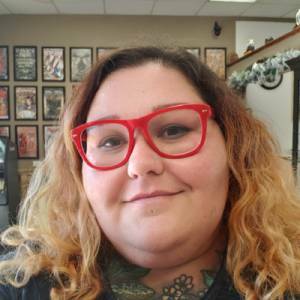 My name is Jen and I have been tattooing in the Central Valley since 2001. I have a loving fiance and an adorable dog named Maya. I love video games, horror movies, and anime. I absolutely love horror video games like Outlast and Amnesia and adventure games like The Legend of Zelda and Elder Scrolls V: Skyrim. My guilty pleasures are still World of Warcraft and Pokemon Go (ask me for my trainer code). My favorite animes are probably xxxholic, Psycho Pass, and The Wallflower. My favorite horror is generally paranormal or supernatural. Films like The Others, or series like The Legend of Hill House give me the creeps, but I also really love foreign horror movies. Strangely enough, the first tattoo I ever got I did myself. I was 11 and I got into my mother’s calligraphy kit which had some bottles of ink in it. I had no idea what a tattoo was, let alone what I was doing. My thought process didn’t even include that it was forever… but anyway, it was a tiny little butterfly on my ankle. It’s still there. 🙂 My first legal and professional tattoo, however, was a purple bat between my shoulder blades. I would hope that if I were not tattooing, I would still be creating art of some sort. I’ve always wanted to become a fine artist and work mainly with oil paint, but I’m not too comfortable with it as of yet. I also wouldn’t mind illustrating children’s books or experimenting with stop-motion animation. I have said that I quit tattooing for brief periods of time, but this is my passion. I don’t know what I’d do without it to be honest. Do you have a favorite t-shirt? If so, what’s on it or what does it say? I am a Cancer sun, a Gemini moon, and a Pisces rising. I’m a mess, but I think it’s accurate for sure. I have a lot of interest in and spend a lot of time nerding out about astrology so I am super loving this question. Puppies or Kitties? These are the most difficult questions ever. lol. I will go with puppies only because I don’t want to hurt Maya’s feelings. Soft tacos or Crunchy tacos? Soft. Morning person or night owl? The night time is the right time. Michael Jackson or Prince? Prince. The world have giant locusts or giant crows? GIANT CROWS! But locusts are neat too. Snore loudly or talk about your secrets while you slept? Well, I already snore pretty loudly and I also talk in my sleep… I’m just gonna go with the snoring. Lose your ability to concentrate or your ability to be creative? I would definitely rather lose my ability to concentrate than lose creativity. I started tattooing in 2001. I was apprenticed at Main Street Tattoo which was owned by Johnny Sin. I was apprenticed by Little John Tharp. Before that I worked in a couple of call centers and fast food restaurants. I was 21 when I started tattooing so I didn’t have a lot of experience doing much job-wise prior to that. I really honestly don’t know if fate exists or if we are predestined to do certain things in life, but I like to think that if it does and we are, then I was meant to be tattooing. It’s inside of me and it is my life. Let me start by saying I read a lot of National Geographic when I was a kid. I was really interested in the women who wore the coils around their necks to elongate them and the women and people who stretched their lips with plates. When I was in my teens, I was always buying tattoo magazines. I was obsessed with how the people looked. The people with partially shaved heads, dreads, tattoos all over their bodies, and giant bones in their noses. 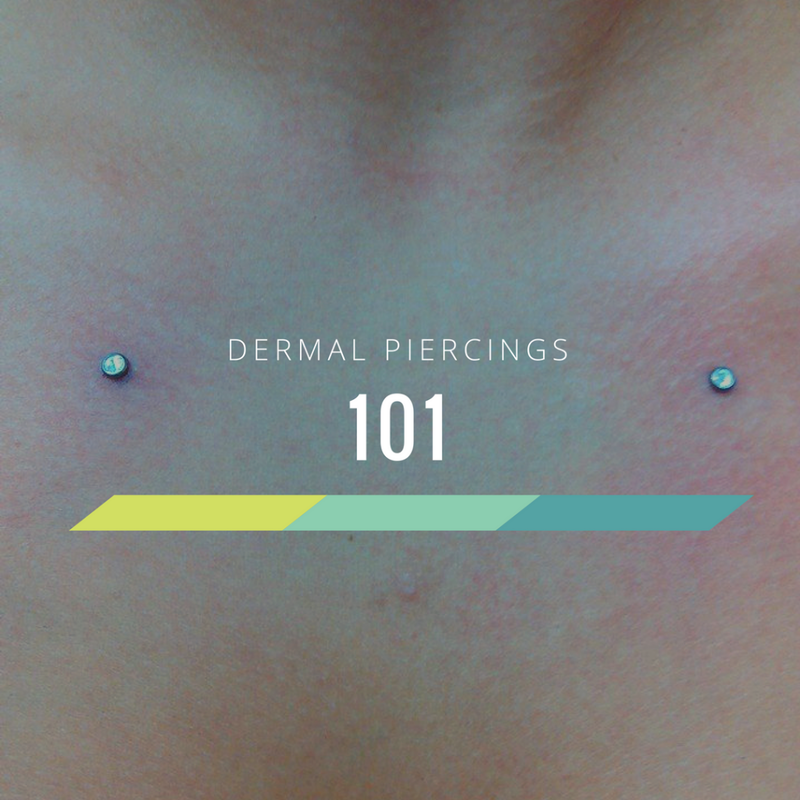 I was really interested in body modification. I liked how people controlled how they looked and how they were perceived by others and how they seemed to step out of society with their appearance. I liked seeing the pictures of people who weren’t afraid to go outside of the norm. They were really beautiful. I wanted to be like them. I had done some body modifications to myself. I did my first tattoo on myself when I was 11 and then again, multiple times throughout my teens. I feel like it was just a part of me and I never gave up trying to get into a shop for an apprenticeship. I was fortunate enough to start tattooing in a shop that had multiple female tattooers. I learned a lot about strength of will and character from those women. For the early 2000’s it wasn’t that common to have had other women around and it was really a blessing. After I left that shop, I really started to understand how much I took for granted and how they had treated me like an equal. When I went to other shops, some of my co-workers would talk behind my back and tell people not to get tattooed by me because “girls just aren’t as good at tattooing” or just because they didn’t like the idea of a woman being a tattooer. I also spent a lot of time reassuring people that I was not the front desk girl or that I didn’t just draw the designs for the guys. I also think a lot of people might have passed me by as a potential artist because I looked really young and I think that people sometimes expected the old biker dude with the beard. Times are different now. I think we owe a lot of that to television and mainstream media. 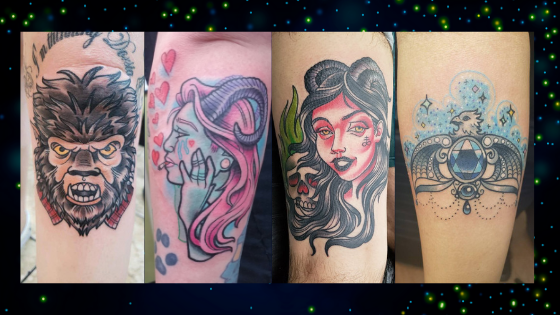 There are so many incredibly influential and inspiring women in tattooing! I super love Kelly Doty, Erin Chance, Anya Gladun, Chelsea Shoneck, Debora Cherrys, and Ly Aleister are just a few. I love tattooing lady heads, cartoony/illustrative and anime tattoos.. I have been doing a lot of pop culture referenced tattoos and that’s been really fun. I would love to do a whole series of mythology inspired tattoos. Especially the creatures of mythology, like nymphs, hydras, harpies, chimeras, oooh even some other sources of mythology like maybe African dieties (who are not creatures) or Japanese ghosts (yurei) or spirits like yokai. I love that stuff. An angel on the labia majora. I think the style I most predominantly present is neo traditional, but I would love to do more illustrative pieces. Pieces that are somewhat more cartoony and colorful. I do watercolor sometimes and oil paint. I used to use acrylics a lot. Lately I have been mostly doing digital art on my tablet. I’m having a lot of fun with it. I feel like a lot has changed. When I first started I was working in a flash shop. A shop where you would come in and just pick designs off the wall. There was no pinterest or google and so most references for other tattoos were from research in books or magazines. I thought that was all there was and would ever be, but a couple of years into it, I started seeing more pieces that were large flowing pieces of artwork. Not smaller one area tattoos. 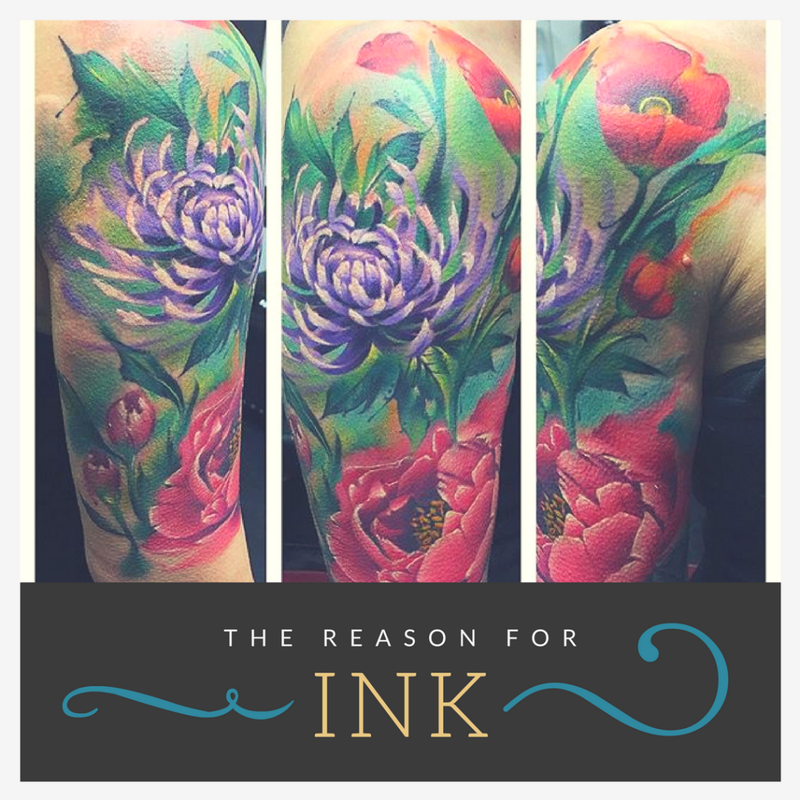 Tattoos that looked like paintings and custom tattoos that were drawn for the client started becoming more popular. The things that were possible in tattooing became more elaborate and artistic. 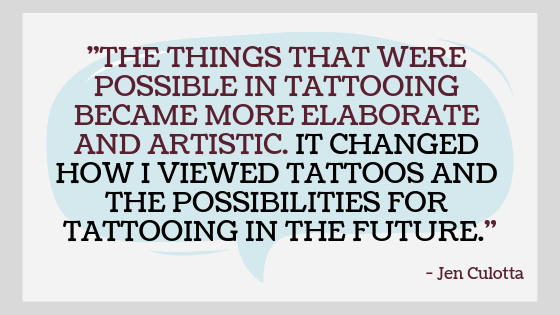 It changed how I viewed tattoos and the possibilities for tattooing in the future. 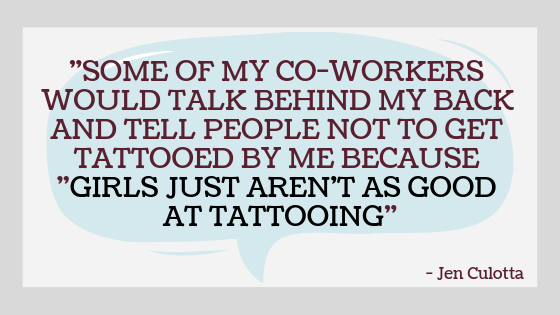 Outside of that, society’s view of tattooing has also changed. It has become more mainstream than ever. It’s more acceptable. Most people now know multiple people with tattoos and other body modifications. I think that’s a good thing. 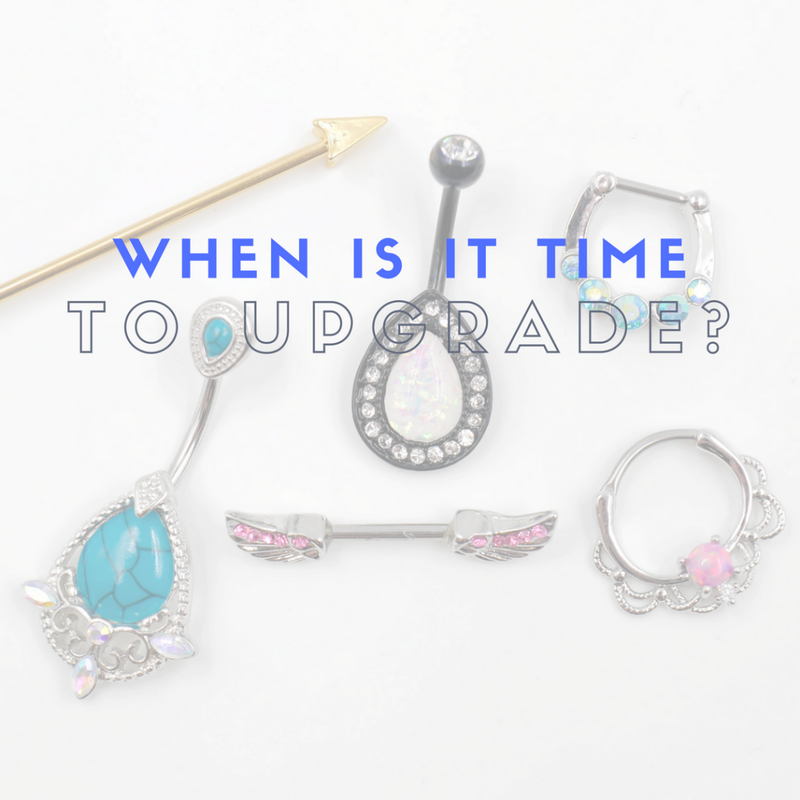 I really feel like it’s encoded in our genetics to want to beautify ourselves or mark/commemorate events in our lives with body modification.